Although winter seems like a distant season away, Winter is the theme for the One Word Photo Challenge. November is here and brought some rain to Northern California and we can look forward to cooler days and (finally!) cold nights. 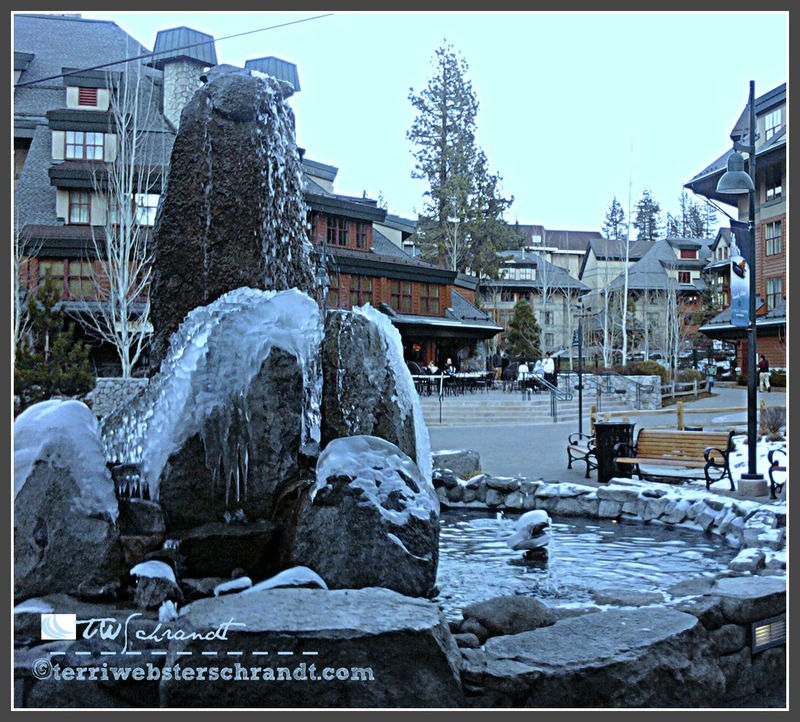 In this photo taken in South Lake Tahoe in early December 2009 near the Heavenly Ski Resort gondola area, it was so cold, even the water in the fountain froze. There was no snow on the ground (yet), but the temperature was 17 degrees Fahrenheit with a pretty good wind chill factor. Are you ready for winter yet? I’m happy Fall has finally arrived! Please check out Jennifer Nichole Wells’ One Word Photo Challenge. Well, I sure do miss it sometimes. I don’t want four months of winter, but I miss seasons (living in Texas, with our two stages of hot). Thank you, Lia! Rain is coming back this weekend, but we’ve had sunny and cold days, which is great for turning those leaves brilliant colors! Hope you are moved in and glad you are getting some sunshine! Raining all night here and lightning downtown! No frozen fountains, however! Years ago when I lived in east county, there were days in January where it was cold enough over night to freeze water. Rare occurrence though. I’m not ready for winter! Come on Powerball ticket, I need a three month stay in Australia! Love this. I for one am ready for winter…but I live in FL where currently we’re having an 85 degree Fall. That’s what we’ve had, too. Cooling down here, now for some rain! Gorgeous picture, Terri! Funny, I watched a show about Lake Tahoe last week. Beautiful place. The houses/cottages/cabins/retreats/chalets…were to die for. I’m on the east coast (New Hampshire). After last year’s never-ending winter, I’m in no rush for snow. Every time you publish a new post stumble it. Janice has a StumbleUpon group, where people stumble each other’s posts, too. Which is an awesome idea. I simply don’t have time. Otherwise I’d join. But check it out. Yes Fall just arrived. But I am seeing winter pict.on FB on WP and when winter finally is here everyone will wish is spring. Oh I even noticed Christmas stuff. I am finally getting some nice pics of fall leaves and can’t wait to post them! That is such a beautiful image Terri. My last chilly winter was in 2012 and I am very much missing snow. Thank you Lisa, it was very cold that day! Good to hear that the Sierras are receiving snow! We had a very light rain last night but “winter” seems ages away as we are still in short sleeves during the day. Nice pic of the fountain. Thanks, Janis, my hubby’s brother reported that it was 85 there in SD yesterday! Although I am not looking forward to winter after Winter 2014-15 that went on and on and on, I reposted this on my FB page. Thanks, Terri. Your picture is beautiful. Thank you very much 🙂 we need a good winter here with snow and rain! We would love to stay in the Autumn Season! My home is ready for winter but I’m not! Haha! It’s finally pouring rain here and snowing in the Sierras. Not sure I’m ready for rain, but I’ll take it 🙂 I’m looking at rain/snow boots online, lol! It certainly is that time of year for snow boots! I hope you find the perfect boots!